Today I will be reviewing True Tea Club with one of their monthly club packages. Once a month you are sent four teas (with the option of asking for your tea preference) to try. They specialise in 9 loose leaf teas – white tea, green tea, black tea, oolong, chai, honeybush, rooibos, fruit infusions and herbal tea. Each tea contains a label on the front with the name, description, type of tea, ingredients and steeping information. A standard box is £10 per month with free UK delivery or £3.50 international delivery, but if you use the code ‘LOVE’ on checkout you will receive 50% off your first box. And FYI – there is a vegan option! Not to mention four free empty tea sacs. What teas did I receive this month? Tropical Sundance is an exotic sencha green tea which provides a rich bodied tropical experience. As the flavors set in motion, the pineapple pieces dominate the sand-filled dance floor as they are effortlessly serenaded by smooth coconut pieces and sunflower petals. Ingredients: Green tea China sencha, coconut chips (Coconut, coconut oil, sugar), candled pineapple pieces (pineapple sugar), flavor, sunflower petals. Opening the packet I am met with a sweet and tart pineapple fruit scent. Like a glass of pineapple juice. An interesting steeping time there, but it comes directly from the front of the packet. Once steeped the tea is light yellow in colour and bares a soft yet sweet, pineapple scent similar to it’s raw form but not as intense. The first few sips reveal a sweet yet sour fruit flavour, still very pineapple dominant, but with elements of dry coconut behind it. Despite the quick steep it has a pleasing strength and flavour which thickens slightly as it cools. It’s more pineapple than mixed tropical but it’s a nice balance and remains refreshing, the only downside for me is the dryness in the after taste. Introducing Cherry Cowboy. A leaf so potent it will blast off the saloon doors. Here you will find aromatic Japanese sencha leaves which come fully loaded with a sweet taste of cherries. Ingredients: Japanese Sencha Green Tea, Cherry Pieces, Flavouring. As I open the packet I am met with a sweet and creamy cherry scent. Very much like cherry sweets. Another quick steeping time recommendation. Once steeped the tea is light yellow and bares a sweet and juicy cherry smell (that somewhat matches it’s raw scent). The first few sips reveal perfumed cherry with sweet highs and dry, grassy lows that come through in the after taste. I can taste the green tea in this one which I like, though the cherry is coming across as artificial, though sweet it’s perfumed and dry. Tastes more like cocktail cherries rather than fresh cherry. 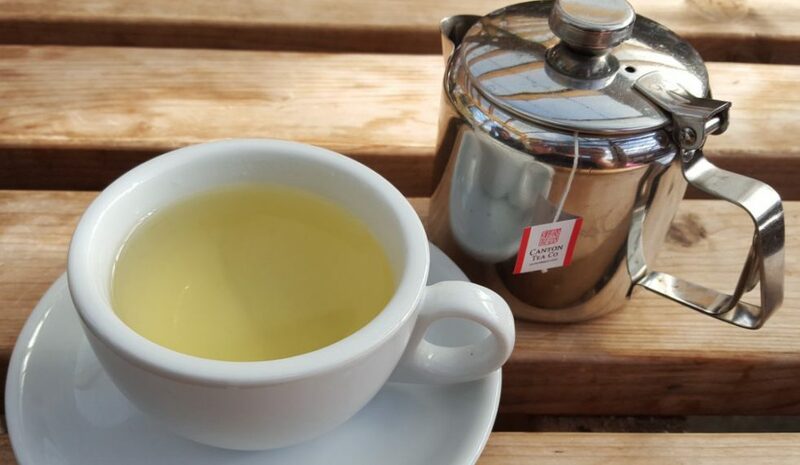 As it cools the cherry softens as does it’s sweetness which become more noticeable in the after taste while the grassy, dry, toasted green tea takes centre stage. Orange Crush is super Charged with a juggernaut of orange slices and cardamon pods. This concotion provides a medium light flavored black tea. Form an allegiance with some milk for a richer tasting cup. Ingredients: Black tea, apple pieces, cinnamon bits, coriander, flavoring, cardamon pods, orange slices, pink peppercorns, cloves. Opening the packet I am met with a creamy and tangy orange scent with a hint of pepper. Once steeped the tea is red in colour and bares a cinnamon scent with an orange undertone. The first few sips reveal a malt base with cinnamon and fruit tones with a dry after taste. Reminiscent of Christmas. As it cools the dryness increases and it develops some sourness. Quite simply, an auctioneer’s dream. There is no reserve on this vintage implosion of almonds. The gavel goes down as the freshness of hibiscus blossoms beckon. Ingredients: Apple pieces, hibiscus blossoms, rose hip peel, orange peel, coconut shreds, along pieces,pineapple cubes, flavoring, safflower and cornflower blossoms. Opening the packet I am met with a sweet, fruity, baked almond scent. Reminiscent of marzipan. Once steeped the tea is bright red and bares a sweet yet tart fruit scent. Not as sweet as it’s raw form. The first few sips reveal a sharp, tartness with sweet fruit tones that leads into a dry and tangy after taste. Not too tart considering the hibiscus but it is noticeable. As it cools the hibiscus lightens in strength but lingers for longer. As for the fruit I can denote apple and orange, though they are still mild. I enjoyed the box and the selection that was sent. The ingredients were a nice quality and I love that information is included to help with steeping times and general info. Another plus is that they do a vegan subscription and also coincidentally all of my teas were vegan. While some blends may not have been to my taste I know they will be to others. I highly recommend subscribing if you’re interested. Receiving random teas is a surprise worth looking forward to each month.